Construct list algorithms using object references. D.4.10 - Here it's the employment of self-referential classes for implementations of general lists - and though not necessarily thinking stacks or queues, certainly these are useful ways of using lists. D.4.11 - The use of self-referential classes in lists via the specific ADTs ArrayList and LinkedList. And though able to treat lists as stacks and queues, also searching, deleting, adding in order through whole lists. And D.4.12 is for tracing through such algorithms. From the Teaching Note, first of all note that isFull( ) should not be included in the methods; that's the whole point to lists, they are dynamic - they are never "full". Yes, and ArrayList can be, and so can any static implementation of a stack or queue via an array, but not an actual list. Next, when reproducing algorithms, make sure you remember the importance if isEmpty( ) when trying to add to or access lists. 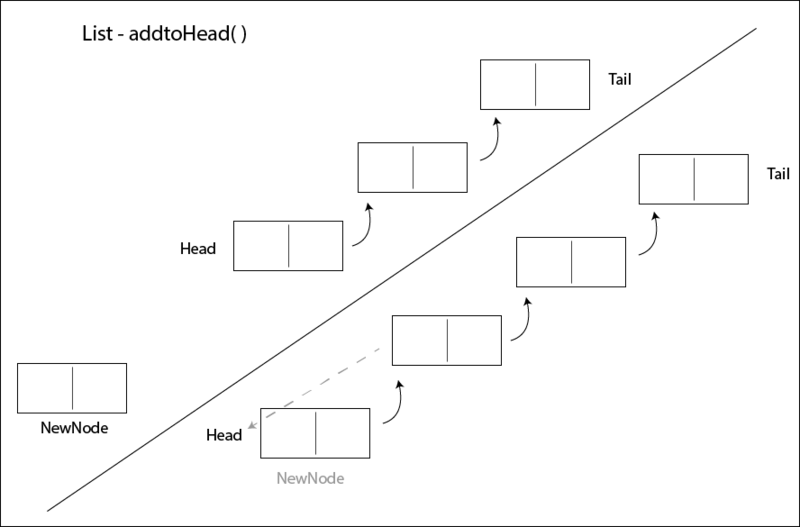 And also note that in terms of OOP and inheritance, this does not require you to extend List to a Stack class and a Queue class, but that that is actually really easy to do: for a Stack class, push just calls addLast, and pop calls removeLast - and with Queue extending List, enqueue just calls addFirst, and dequeue calls removeFirst. If you wish, this animation is great to slow things down and look at what's literally happening line by line, and at the memory level. Note though that the insertion happens from the front, so it is an enqueue. Animation of Adding to A List - With this you can go step by step. A lot of this you have recently seen in Topic 5. 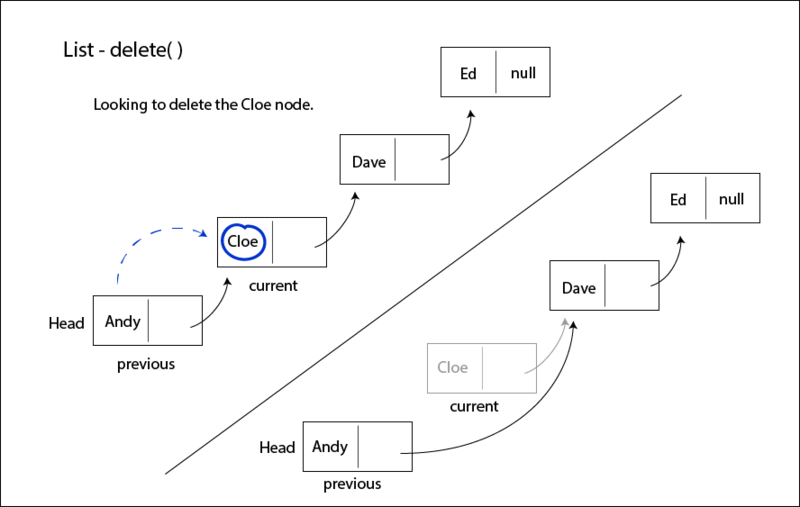 Remember that for Topic 5, it is to a level of diagramatic understanding, but with the OOP Option Extension, it is to an algorithmic, coding level. Make your new Node, and link it to head. Then make the head variable to be changed to be your new Node. This works even if head is null. And before even doing this, we need to check to make sure the list is not empty. And if it is, just make our new Node to be the head. Make a Node called "current", and set it initially to head. shift the current one link up each time. Set the next of the current (which is was the tail) to be the new Node. In words: We will need to traverse up the chain (assuming it's already in order) and when what we have is greater than where we are at, that's where our new node goes. So start with a new Node, and "current" starting at the head. But you will also need to keep track of the "previous" node for linking purposes later on. Using a compare operation, if this is the case, your newNode needs to point to the head, and then it becomes the head. Otherwise, you will loop through the list, each time, checking if the node where you are at is greater than the node you are adding, and each time moving the previous up to the last current. When it is no longer the case that your node is greater, you have found the position for the new node. So you will link it there by setting the "previous"'s next to be your newNode, and your newNode's next to be the current. In words: The idea here is to locate the node you want to delete and link around it. Start with a current and a previous node, as with all list traversals. Before you get going check to see if the head is equal to what you want to delete, and if so, set head to be its next. If that wasn't the case you need to keep looking, one step at at time. 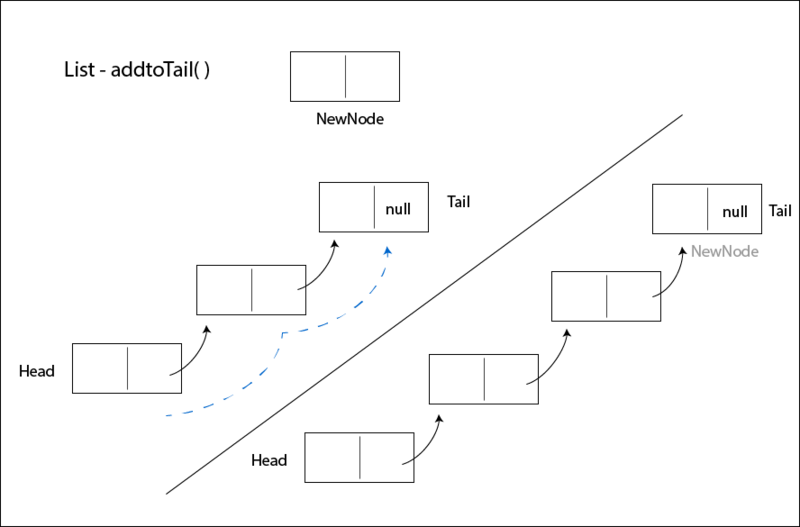 As with other traversals, as long as the getNext( ) does not return null, keep on looking. Make the previous point to what the current currently is pointing to. That breaks the link to current. In words: This is simply traversing through and doing something at each node. We do this starting with a "current" node being the head. And then one step at a time, print out the data at each node. And go to the next node with current.getNext( ) as long as getNext( ) is not null. In words: The list is empty if the head is null. So we return the boolean true or false of head == null.